This year marks the 100-year anniversary that a hunter named John Breen took a great deer in the Minnesota North Woods of Beltrami County. 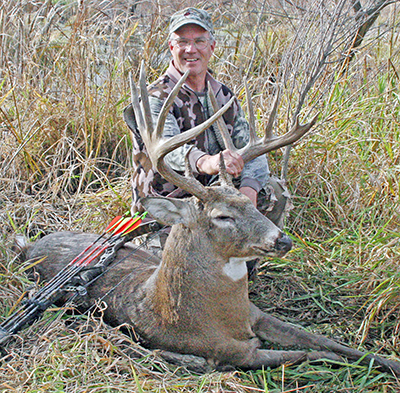 The “Breen Buck” eventually would score 202-0/8 by the Boone & Crockett Club and would be recognized as the first B&C World Record Typical Whitetail Deer. It would hold that title until 1971. The deer that knocked the Breen Buck from its No. 1 position and would become the next world record typical was taken by a hunter named Jim Jordan. He took his great buck in 1914, four years earlier than the Breen Buck, but for many years the head and antlers had been lost to history. In 1971 they resurfaced and scored 206-1/8 and were declared the new world record typical. Interestingly, the Jordan Buck was taken along the banks of the Yellow River only a few miles from the Minnesota/Wisconsin border. So there you have it: The first and second world record whitetails taken only four years and just couple hundred miles apart in the great northwoods region of the Upper Midwest. Crazy coincidence or are there reasons that happened? No one really knows, but there is no doubt that the closeness of these two deer in time and distance fosters comparisons between the two monarchs as well as differing theories – and even a bit of a rivalry – between the deer hunters of the two states. 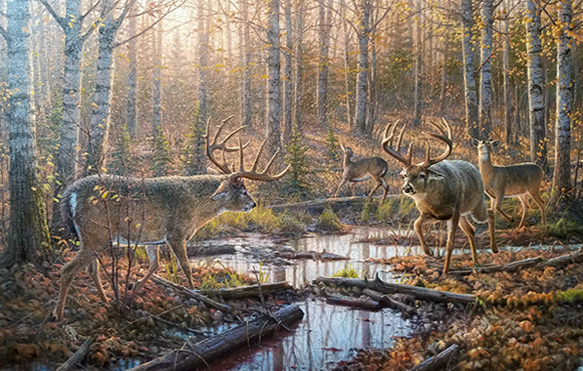 With this deer hunting history in mind, it seemed inevitable that Michael Sieve, a loyal son of the great state of Minnesota, would team up with Greg Alexander, a loyal resident of Wisconsin, and paint these two massive bucks in an epic confrontation along their common border. Each artist has worked to portray his home state’s favorite son (buck) as the more impressive and noble of the two. In this artistic duel, Sieve believes he has the upper hand. The Breen Buck outscores the Jordan Buck in total inches before deductions and according to Sieve, is clearly the more impressive of the two. Score one for Minnesota. Greg Alexander counters with the fact that the Jordan Buck knocked the Breen Buck off its throne, a position it perhaps didn’t deserve anyway. Tough to argue the facts. The two artists and friends co-created the two legendary bucks in a piece titled “Border Battle”.